We love the flavor of s’mores, but sadly, the chocolate and marshmallow goodies don’t meet our clean-eating goals. That’s where this recipe for Vegan S’mores Shakeology comes in. It captures the iconic flavor — and we can drink one every day if we want! A scoop of Chocolate Vegan Shakeology gives this smoothie a rich, chocolaty flavor, vanilla extract stands in for the sweet marshmallow, and real graham cracker crumbs blended into the shake and sprinkled on top are the finishing touch. 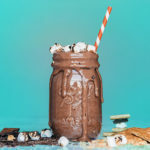 This Vegan S'mores Shakeology captures the iconic flavor of chocolate, marshmallow, and graham cracker s'mores, and we can drink one every day if we so desire. Place almond milk, ice, extract, Shakeology, and 1 tsp. graham cracker crumbs in blender; cover. Blend until smooth.